Want the perfect gift for Father’s Day? Aside from the amazing ribs and bbq sandwiches offered by Lillie’s Q, treat dad to Chef/Owner Charlie McKenna’s special award winning BBQ – six regional BBQ sauces and spice rubs made in-house that perfectly compliment Lillie’s Q award-winning BBQ. All sauces are $8.00 each. 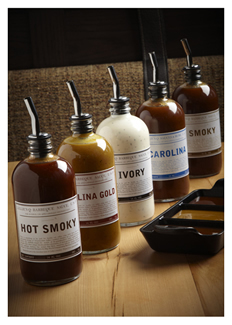 Flavors include Smoky, Carolina, E.N.C., Hot Smoky, Carolina Gold and Ivory. For details, visit: http://www.frenchmarketchicago.com/vendor/lillies-q.